The narrow waist model is available in boy's sizes 8/10 and 10/12. But this label placement is even worse - something important goes there. A pair of sharp scissors solves the problem. “Thomas” from Australia has both narrow & wide versions: I own the wide version of this dancebelt which I do not like. The narrow version is very comfortable and does not show seam lines under tights. I like that it doesn't sit too high on the hips and the thong isn't too wide. The seam that joins the front section to the back can be rather uncomfortable if you don't position/straighten it out when you first put it on - but once you have it on right... you can wear it all day long without any discomfort. 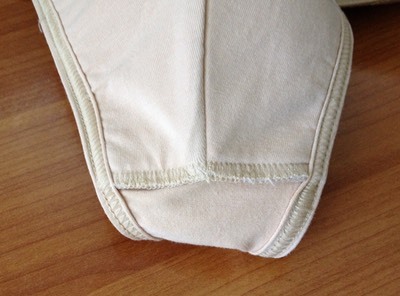 The support is excellent and it shapes thing nicely underneath tights. “Amy” writes about her son’s first dance belt: After getting over the initial shock (I have to wear WHAT?!? ), my 11 year old son has no issues with this dance belt. He's a very slender build and we washed it before the first wearing, to soften it up. He wears it 4 times a week and thinks it is very comfortable. It provides good coverage. "Homeschool Mom" gives it 5 stars: I purchased this for my son when his artistic director told him he needed to start wearing a dance belt. After reading reviews, I decided to go with this one for the comfort and stability it offers. My son loves it, although he said it did take some getting used to! He says it is very comfortable. We put them in the washer and hang them up to dry. He currently has 3 pair, since he dances 6 days a week. I foresee us buying one for each day! “Jennifer J” can’t get her boy out of it: My 9 year old loved this dance belt. He would wear it all day if I didn't suggest otherwise. “Ballet Parent" says it’s a good fit for a young boy: This is my 7.5 yo son's first dance belt. Our local dance store carried only full seat dance belts for boys, which I didn't think would work because even the smallest size looked too big and I don't really see how a full seat is better than regular form-fitting underwear for a youngster. He is 4' 1" tall and about 53 lbs. and the 8/10 youth fits him well. He's now worn it twice to perform and although he says the thong is a bit uncomfortable, he says he will get used to it, and he likes how he looks in his tights. It looks very well made and I would expect it to hold up well. We cut out the tag. “Sky E” has two dancing sons. Both like WearMoi: These dance belts are great. They were just what I needed for under white tights for performance. Both my 6 1/2 year old with 21" waist and my 7 1/2 year old with 23" waist fit into the size 8/10. Initially I only planned for them to wear them under the tights and not to class but they have started to wear them for all dance now and whilst initially they found the back a little uncomfortable, they find the front much better than without -- I guess I didn't expect that boys so young would benefit from proper support. I have found the transition easier for the younger one (who asks to wear it) than the older one who is getting a little self conscious, I imagine it would be much harder later on. If you're thinking your boy is too young for a real dance belt don't hesitate, the younger they get used to proper boys dancewear and support the easier it will be so take the plunge.